The 230 Miles per Gallon Claim: The General Motors (GM) announcement last week that the Chevrolet Volt would achieve 230 miles per gallon in city driving and a rating of more than 100 miles per gallon with combined city and highway driving sadly contains more hype than reality. 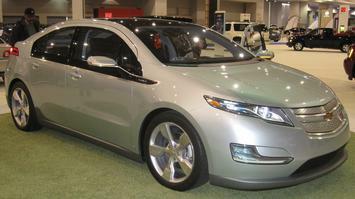 The Chevrolet Volt is a plug-in hybrid vehicle that GM intends to begin marketing in 2010. GM has indicated that the car will be able without gasoline for 40 miles, on its rechargeable battery. After the battery is depleted, the car would begin to use gasoline. The 230 mile per gallon figure, according to GM, was calculated using a proposed but yet not revealed Environmental Protection Agency fuel economy testing procedure. Similarly, the details of the GM calculation were not revealed. Criticisms: Rather than the expected praise, the GM claim was met by a barrage of questions and criticism. Consumer Reports said that the 230 miles per gallon claim might be the exaggeration of the century. Automaker Nissan, facetiously responded with a claim that its forthcoming all electric (not hybrid) “Leaf,” would achieve 367 miles per gallon in a Twitter post. Nissan, unlike GM can be excused for not providing the details of its calculation, since it was “making fun.” EPA distanced itself from the GM announcement, indicating that it had not yet tested the Volt. The criticisms and questions revolved around a single issue: How had General Motors calculated the 230 miles per gallon figure. Regrettably, General Motors has yet to provide a complete answer. From the sketchy details released, it appears that the 230 mile per gallon rating was based upon the assumption that a driver would travel less than 40 miles each day and recharge the battery at night. Using this methodology, there would never be a reason for the car to use gasoline, so long as the daily mileage is less than the battery capacity. A New EPA Rating System: Reportedly, the EPA’s fuel economy testing procedure for plug-in electric vehicles (whether hybrid or not) will report kilowatt hours (KWH) of electricity consumed per 100 miles. Presumably, this rating will be placed on the fuel economy window sticker on new cars, perhaps alongside some miles per gallon conversion. GM indicates that the Volt will consume 25 kilowatt hours per 100 miles in city driving. Policy Imperative for Improving Fuel Efficiency: The impetus for improving automobile fuel economy is being driven by public policy objectives to reduce greenhouse gas emissions, especially carbon dioxide (Note 1), and away from the consumption of petroleum . Even though the Volt will produce no greenhouse gas emissions from its tailpipe when operating in the electric mode, the electricity that drives its battery would come from power plants, many of them relying on fuels like coal, which produce high amounts of greenhouse gas emissions. In fact, coal accounts for roughly 30 percent of all electricity production in the country; other fossil fuels another 35 percent. A Flawed EPA Fuel Economy Rating System? Neither the GM calculation nor apparently the proposed EPA rating system include greenhouse gas emissions from electricity generation. A greenhouse gas gram emitted from an electric power plant smokestack has the same impact as one from an auto tailpipe. Any EPA fuel efficiency rating system that does not take into consideration power generation emissions would be shockingly incomplete and misleading. Consumers would not be given reliable information on the greenhouse gas emissions from cars they might purchase. One would expect that a government committed to greenhouse gas emission reduction would task its implementing agency with ensuring the availability of relevant and reliable information. Power Generation and Plug-In Cars: On average in the United States, the generation of each KWH produces 610 grams of carbon dioxide (1.35 pounds). By comparison, combustion of a gallon of gasoline emits nearly 8,900 grams of carbon dioxide. Thus, nearly one gallon of gasoline is the equivalent of approximately 15 KWH of electric power in its greenhouse gas emissions (Note 2). Thus, if the Volt uses 25 KWH to travel 100 miles in an urban area, then the greenhouse gas emissions from generating its power will be somewhat over 15,000 grams (Note 2), or the same as 1.7 gallons of gasoline (Note 3). Under these average operating conditions, the Volt would achieve approximately 60 miles per gallon (Note 4). Exaggeration Doesn’t Help: Now there is nothing to be ashamed about 60 miles per gallon, unless, that is, you have claimed 230 miles per gallon. Regrettably, General Motors, which could have claimed a great environmental advance, has diminished it by failing to “level” with the public. This kind of public relations will not help a company whose performance has cost it market share for well over a generation. . The Volt (and the Leaf) Will Get Better: Of course the equivalent miles per gallon would be much higher if US power generation were more efficient. And, it will be. For example, it has been proposed that electric power generation needs to become at least 80 percent less greenhouse gas intensive by 2050. If this is accomplished, the Chevrolet Volt could indeed achieve 230 equivalent miles per gallon and perhaps the Leaf 367. But neither car will reach these plateaus in the short term. A Better Fuel Economy Rating System: Since the EPA fuel economy rating system has not been finalized, its potential defects can be corrected. Any EPA fuel economy rating system should include a greenhouse gas emissions indicator. This should be provided for city driving, for highway driving and a combined overall figure. Moreover, such a rating must include the very real emissions that occur at the power plant. It would be appropriate for EPA to continue reporting miles per gallon and adding KWH per 100 miles, so that the cost impacts are clear to purchasers. Regional Variations: There is another complicating factor – regions. For example, in North Dakota fuel economy would be approximately 35 miles per gallon equivalent with full electric operation, well below the average 60 equivalent miles per gallon. On the other hand, in the state of Washington, the Volt would achieve its 230 miles per gallon equivalent, nearly 7 times the North Dakota fuel efficiency. This is not because people in Washington are more environmentally sensitive than North Dakotans. The difference is in type of power generation. Nearly 80 percent of Washington’s power is generated by hydro-electric and nuclear plants, which produce virtually no carbon dioxide emissions. On the other hand, nearly 80 percent of North Dakota’s electric power is produced with fossil fuels. These differences will be moderated as electric power production becomes less greenhouse gas intensive. The Bottom Line: Despite the exaggeration and misleading information, this story is far more positive than negative. Congratulations to General Motors (and Nissan) on the strong advances they have apparently made in vehicle technology. This is just further evidence of the potential of human ingenuity. From the 150 mile per gallon cars to which President Obama is committed to the zero emission petroleum car system demonstrated by a Georgia Tech team, the good news is that people can continue to live as they like, while admirably reducing their greenhouse gas emissions to meet whatever objectives are ultimately adopted. 1: Carbon dioxide accounts for the overwhelming share of greenhouse gas emissions from motor vehicles. 6: A grams per mile rating system should include “upstream” activities, such as the greenhouse gas emissions required to produce and distribute petroleum, which by various estimates increases the emissions by 20 to 25 percent. Similarly, upstream electric power production emissions should be included.